“Demo at Indianapolis 2015 3"
More roses, more color, and more abstract. Doing a floral as my third demo has become default now. This style is evolving. I feels the potential, and try my best to make it happen. This painting is still available. So I put it on Dailypaintworks. I am back in Austin now. I have about two weeks time home before my next workshop. More exploring and learning will happen to me. This is the second demo - copper and flowers. I have arrived at Indianapolis three days ago. I co-juried the Hoosier Salon show with California artist Randy Sexton, and my workshop started this morning. I want to thank Hoosier Salon for this great opportunity of teaching at Indianapolis. Thanks to artists coming from over for taking my workshop. This is my first demo painting. Since my white rose is still fresh, I did another rose painting. This painting is a little larger, 12" x 12" For this painting, I have documented the whole painting process by taking a series of progressive photos. I plan to make this document available on my website in the near future, so everybody can access to it. I can use this method to show how I paint roses. I need to learn how to do it. If you have information on how to do online teaching, please help me out. I am in the mood of painting flowers. I did this rose painting with only one white rose. First I orientated it for the center of focus. Then I relocated it to the back and left side. I have learn the approach from Richard Schmid. It combines the bold abstract brush work and detailed realistic presentations. I really like this piece of visual music. Painting flowers is my 3rd demo. Having doing this kind of floral painting for a while now, I have started to see the potential for this approach. I used to consider flower is a part of my still life, but more and more I have made my floral painting deviate from my usual way of still life painting. The style and approach are all different from what I have been doing. I will investigate more on my floral painting to bring it to a higher level. This is the second demo I did at Lake Zurich workshop. You know the still life objects have their own personalities. In this setup, the bronze is showing the pride, and the brass is showing the support. I had fun painting them. I have arrived at Chicago yesterday, and today is the first day of my workshop at Lake Zurich, IL. I want to thank Frankie Johnson for organizing this workshop and thanks to all workshop attending artists for coming and painting with me. My first demo involves all warm colors. Color harmony is so important. You don't need many colors to makes a painting colorful and exciting. I went to the Mayfield Park again and painted this plein air floral painting. Different from my usual still life paintings, the flowers are much fresher and different kinds, and the leaves are in much better shapes. It looks my full month of painting and learning will pause for a while. I am traveling again tomorrow and will teach a couple of workshops in a row. I will show you my demo paintings again. I hope you will not get bored with them. Life goes on, and we must do our best to survive. I will keep on painting and hope I can progress everyday. It does not matter how small the progress is, if we keep on going, we will see the difference. This is another plein air painting I did at the Mayfield Park. I have no idea about the use of this building, but it has an interesting shape. It was a sunny day. I like the warm tone of the building against the trees in the back ground. The Texas summer is in a full swing. It was pretty hot even in shade. I went to Plein Air painting today with our local PAA group. The location was the Mayfield Park. I was amazed by so much scenes we can paint. I may go there again to paint this days. I picked this ivy covered stone arch way. It is wonderful combination of man made structure and the nature. I have really enjoyed myself today. 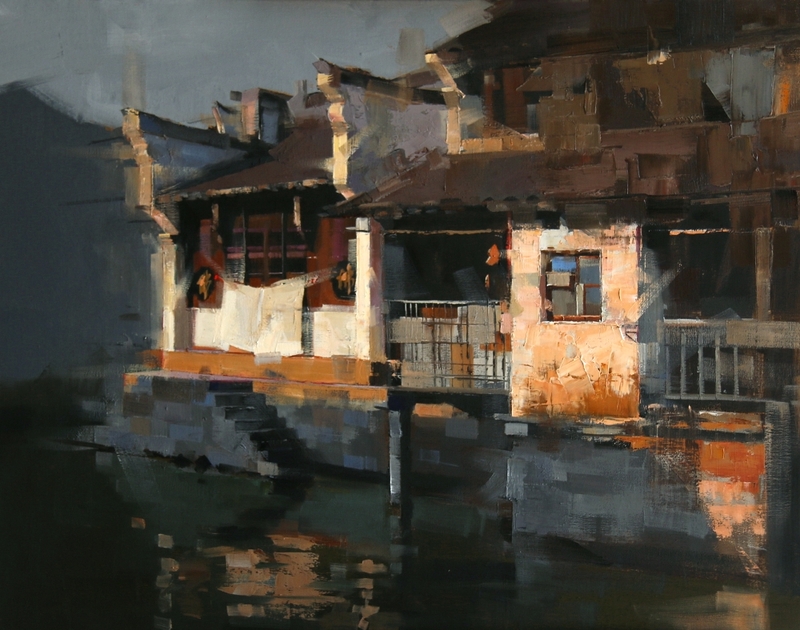 "Wuzhen Canal 3 (Day 3)"
This is another large painting (36" x 24") in progress. I like this composition. It has three layers: the far field, mid field, and the near field. I have given enough details on the boat, but I have not worked on the edges. Currently, I have 6 large paintings going simultaneously. I work on one for a while then work on another one. Progress is rather slow, but I have a little everyday. Now I have felt that painting is a rather labor intense work. I wish I have more energy. It is very different from my old discipline of small daily paintings. I use to finish a painting in a couple of hours. You might have remembered I posted the same painting on May 25. I thought I was very close to the finishing point at that time. However, I have spent 3 more days on it. I have seen so much potential on this painting, and I might want to spend a few more days on it. From my previous post on this painting to now. I have been working on the color and edges. I enhanced the warmth of the color in the light area so the painting gets much more colorful than before. Working on the edges was a tough task. I have already had a lots of details and the painting was very tight at the previous stage. I have to destroy unnecessary details to get loos. I like this painting today much more. This is a demo for my Tuesday morning mentoring class. Dragon's eyeball is a kind of tropic fruit. The eatable part is translucently white, and it has a dark colored core. It is very sweet. "San Miguel Street (Color study)"
This is a 9" x 12" color study before I do a large painting. Havng done a few large paintings, I have learn that doing a small color study is very important. It helps me to determine the general color scheme, harmony, and a general design. I don't have the habit of doing color studies because I used to paint small. 9" x 12" had been considered as a large painting for me. Now I play different game now. When I did my large Austin painting, I really learn the hard way. I directly jumped into the large format. Oh boy! I have wasted so much time and paints just try to get the color scheme I wanted. Now I always do a small color study before I paint on a large canvas.